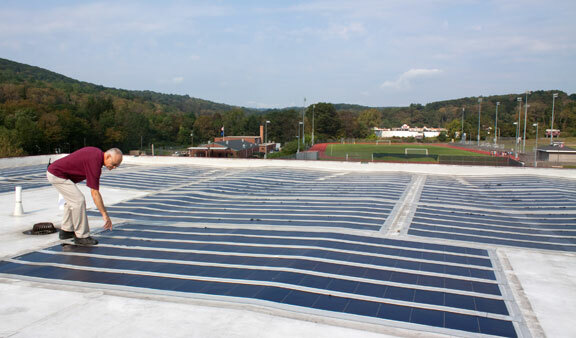 NAUGATUCK — As borough officials deal with the ramifications of failing solar panels built into the roof of Naugatuck High School, they are making plans for a solar array to take their place. Officials discovered earlier this year that the photovoltaic solar panels on the roof started to fail. The panels were built into the roof when it was replaced about nine years ago. Since the electrical components are built directly into the roof and the panels are attached to the roof, removing the solar system means replacing the entire roof of the school, officials say. 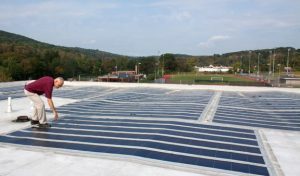 Kevin Dion, the director of facilities for Naugatuck schools, said the solar panels have been disconnected but still pose a danger since they are constantly producing electricity. “So even if you shut them down as far as connection to the grid or school, they are still producing a small amount of energy. With that energy, if you have a break in the protective laminate covering, you have a risk of electric shock,” Dion said. While the panels are still producing energy, Dion said there is only a small chance they can damage the roof. Mayor N. Warren “Pete” Hess has estimated that it will cost around $5 million to replace the roof. The state typically reimburses school districts for roof replacement projects, but the roofs generally have to be at least 20 years old. Hess planned to talk with state officials about any possible reimbursement. Even if the borough doesn’t receive any help from the state or its insurance carrier, it will move forward with the project since it is an emergency, Hess said. “We have no choice but to go ahead with the project,” Hess said. As officials determine how to go forward with replacing the roof, the Board of Mayor and Burgesses last week chose Advanced Energy Efficiencies as the energy consultant company to oversee a new solar array project eyed for when the roof is replaced. The company will also oversee a potential microgrid project to provide electricity to the high school and Western Elementary School. Unlike the panels on the roof now, the array would sit on the roof and not be built into it. Hess said the borough needed to move forward with the new solar project in order to take advantage of the state’s Zero Emission Renewable Energy Credit (ZREC) Program. Under the program, the state pays companies a set rate for every 1,000 kilowatt hours of power generated. The companies then sell the energy to their clients, in this case the borough, under a power purchase agreement intended to save the buyers money. The borough has to apply this month for the ZREC program, Hess said. I just hope that any town employee making the “built into the roof” past decision isn’t allowed to be in discussions with these new system. Wow…what a plain stupid decision.